Nagato-Sensei’s classes are very popular with the foreign visitors training at the Hombu Dojo. He speaks English (unlike some other teachers who require a translator), and he is well-known for insisting that his students actually hit each other (controlled, of course) to get used to being hit in an actual fight. I only attended one of his classes, but when I attended Duncan Stewart’s class they were reviewing what he had taught them a few days before. So I sort of got a decent idea of what he emphasizes. He likes to do techniques against two punches, drawing the opponent into the second punch and then responding. He would stay on the outer limits of the opponent’s reach, and then dive in being really close. Given all his professional kickboxing experience, it is telling that he avoids spending time in kickboxing range. He would either be just beyond it or way within it, to totally smother any further attacks from the opponent. He would also, from what little I saw, close the range with a spiralling movement. That would shed off any further attacks from the opponent and render them ineffective. Nagato-Sensei was also kind to this visiting foreigner from Singapore. He chatted with me at the end of class, asking me questions about Singapore, and setting me at ease. 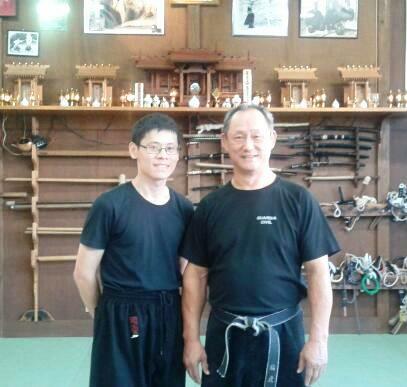 I really appreciated that, especially coming from him, a shihan of almost legendary stature!